I’ve seen this advertising poster on trains running from Shibuya and Yokohama for a while now. It features four, rather serious looking men facing a man, who is visible only from the back. It looks like they are interrogating him. 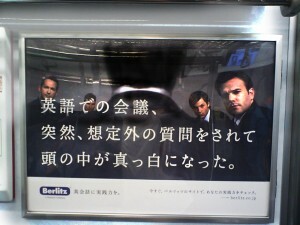 Below the photo in smaller copy it says, “Check your English proficiency level, right now at the Berlitz website.” (今すぐ、ベルリッツのサイトで、あなたの実践力をチェック。) followed by a web address.